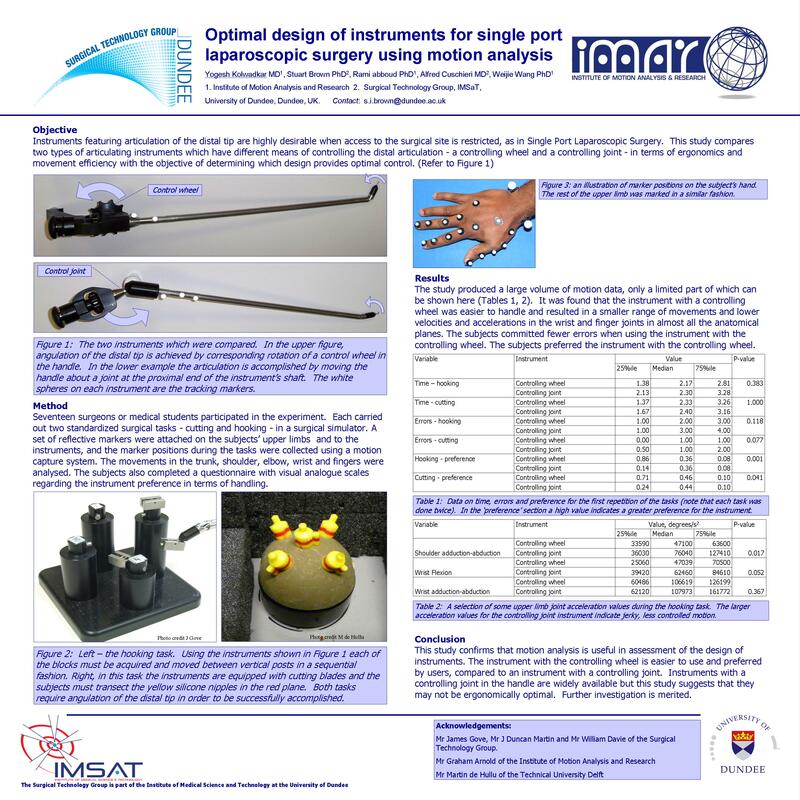 Objective: Instruments featuring articulation of the distal tip are highly desirable when access to the surgical site is restricted, as in Single Port Laparoscopic Surgery. This study compares two types of articulating instruments which have different means of controlling the distal articulation – a controlling wheel and a controlling joint – in terms of ergonomics and movement efficiency with the objective of determining which design provides optimal control. Method: Seventeen surgeons or medical students participated in the experiment. Each carried out two standardized surgical tasks – cutting and hooking – in a surgical simulator. A set of reflective markers were attached on the subjects’ upper limbs and the marker positions during the tasks were collected using a motion capture system. The movements in the trunk, shoulder, elbow, wrist and fingers were analysed. The subjects also completed a questionnaire with visual analogue scales regarding the instrument preference in terms of handling. Results: It was found that the instrument with a controlling wheel was easier to handle and resulted in a smaller range of movements and lower velocities and accelerations in the wrist and finger joints in almost all the anatomical planes. The subjects committed fewer errors when using the instrument with the controlling wheel. The subjects preferred the instrument with the controlling wheel. Conclusion: This study confirms that motion analysis is useful in assessment of the design of instruments. The instrument with the controlling wheel is easier to use and preferred by users, compared to an instrument with a controlling joint. Instruments with a controlling joint in the handle are widely available but this study suggests that they may not be ergonomically optimal. Further investigation is merited.